The ACLU's new Torture Database now makes it easy for the public -- and reporters -- to search through over 100,000 pages of documents related to the Bush administration’s rendition, detention, and interrogation policies and practices. For the last eight years, the ACLU has litigated Freedom of Information Act requests for records documenting the treatment (too often mistreatment) of detainees in U.S. custody in the years following 9/11. Our efforts have resulted in the public release of over 150,000 pages of documents, including many of the key documents revealing who in the Bush administration authorized torture and abuse and the effects of that torture on prisoners. The release of these documents -- such as the legal memos issued by the Department of Justice authorizing the CIA to use harsh interrogation techniques -- fueled breaking news stories, public debate, and analysis. We have long been conscious, though, that obtaining the documentation of abuse and putting it on our website was not enough for a story of this importance and complexity. Notwithstanding the tremendous reporting to date, the primary evidence of torture and abuse in the years following 9/11 has often been difficult for reporters, researchers, and the public to access. That is why, on June 26 -- the International Day in Support of Victims of Torture -- we launched our Torture Database, the culmination of a two-year project intended to allow easier and more sophisticated access to these primary-source documents. We have individually tagged every single one of the thousands of documents in the database with an array of meta data -- essentially categorizing the documents -- to allow quick and easy filtering. For example, we tagged every document with the detainees mentioned, the government officials mentioned, the methods of interrogation or abuse mentioned, and much more. The result is a powerful but easy-to-use database. Filter for legal memos authored by the OLC, and you will immediately see that the DOJ released 42 such memos, most written in 2004. Filter for Abu Zubaydah, and you will find 30 documents, 16 of which mention waterboarding, and 5 of which mention John Yoo (the Justice Department lawyer infamous for authorizing torture). When you dive even further into the documents, you will also find inspiring and heroic stories of dissent. American soldiers, lawyers, officials, and others who resisted the abusive interrogation policies that senior political leaders approved. Those courageous efforts met fierce resistance from a handful of administration officials committed to the regime of abusive interrogation that they had created. In the end, only public disclosure of the brutality of our government’s mistreatment of prisoners brought the failed experiment to a close. Compiling the documents as we did has also made it easier to piece together what’s missing. To date, the government continues to withhold thousands of records critical to understanding the Bush administration’s development of harsh interrogation techniques. 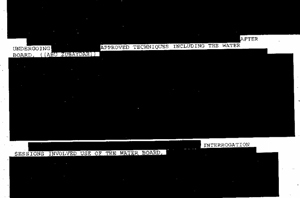 It refuses to release CIA cables describing the use of the “enhanced interrogation techniques,” thousands of photographs of detainee abuse, and the presidential directive authorizing the CIA to establish its secret prisons. Our hope is that the Torture Database will serve not only as a historical repository but as a living resource to those pushing to fill the gaps left in the public understanding of our nation’s shameful experiment with torture and abuse. We will continue to add documents as we receive them.